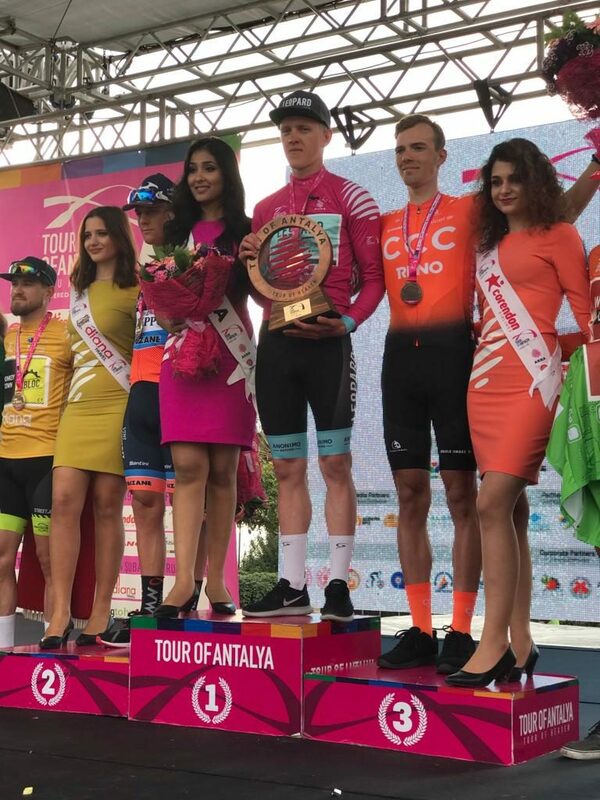 Attila Valter finished third in the general classification of the Tour of Antalya. The four stage race was won by Szymon Rekita (Leopard Pro Cycling). – I would like to thank my teammates for the work they have done for me during the final stage of the Tour of Antalya. The route was flat and the differences in the GC were small. My 3rd place in GC is our common success – said Attila Valter. The last stage of the Tour of Antalya was dedicated to sprinters. During the first hour of the race, three riders broke away from the peloton, gradually increasing their lead over the main group. After covering 100 km, the escapees were caught. Then, a group of 6 – 7 cyclists left. They, in turn, were caught about 20 km to the finish line. Roy Jans (Corendon-Circus) took stage victory in a bunch sprint. The main task of the CCC Development Team riders was to work for Attila Valter. After the royal stage of the race, Hungarian jumped to the third place in the GC. However, as the differences between the GC contenders were small, and the last stage was a stage for sprinters, the key to defend the third place on the podium was proper cooperation. – I have the impression that the boys have worked harder on me today than on Saturday, when I managed to jump to the third place in GC. They covered me from the wind, and when key riders for GC tried to break, they immediately started to chase. Thanks to their work, no one, who could have threatened my place on the podium, was able to go – said Attila Valter. He added, that when he had a puncture in the 93rd kilometer, Patryk Stosz gave him the wheel. Valter was placed in a very good position for the last meters. – Around 500 meters to the finish, sprinters started to fight for the position. I was pushed by one of the riders and I saw that something was wrong with my bike. I was not able to go, but in a second Kamil MaÅ‚ecki appeared and gave me his bike – said Valter. Because the mechanical took place inside the last 3 km, Attila Valter was given the same time as the winner of the stage. – I was a leader for the first time and I have to admit that during the first stages I was slightly stressed. I felt enormous responsibility. Fortunately, I was becoming more and more confident every day. I would like to thank our sports director for the trust and also my teammates for their effort. I am very happy – Hungarian added.